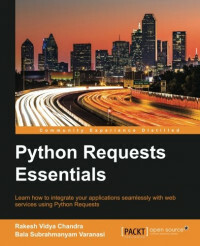 If you are a Python administrator or developer interested in interacting with web APIs and have a passion for creating your own web applications, this is the book for you. Basic knowledge of Python programming, APIs, and web services will be an advantage. Python is one of the most popular programming languages of our era; the Python Requests library is one of the world's best clients, with the highest number of downloads. It allows hassle-free interactions with web applications using simple procedures. You will be shown how to mock HTTP Requests using HTTPretty, and will learn to interact with social media using Requests. This book will help you to grasp the art of web scraping with the BeautifulSoup and Python Requests libraries, and will then paddle you through Requests impressive ability to interact with APIs. It will empower you with the best practices for seamlessly drawing data from web apps. Last but not least, you will get the chance to polish your skills by implementing a RESTful Web API with Python and Flask!